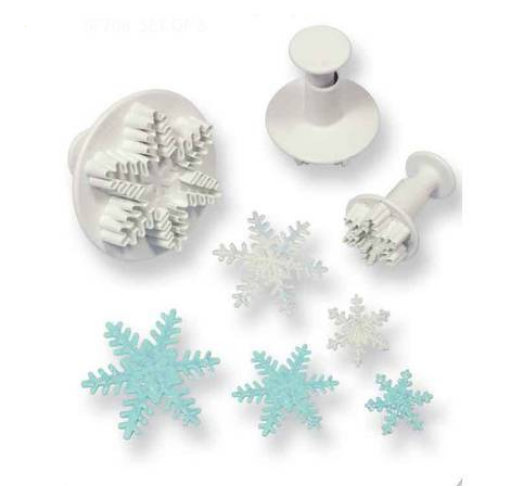 We are really excited to be adding a great range of Wilton cake decorating equipment, including sugarpaste icing, cake decorating tools, bakeware and cake decorating ingredients to our extensive range of cake decorating products available from our cake decorating shop in Knowle, Solihull, Birmingham. 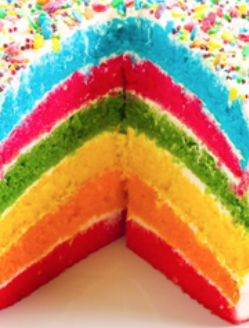 Wilton Brands are the industry leader in cake decorating and bakeware. When it comes to cake decorating and bakeware Wilton offer a fabulous quality collection perfect for beginners and professional cake decorators whether creating wedding cakes, birthday cakes or celebration cake we’ve got it covered. From Sugarpaste icing, cake pans, cupcake cases and cake ingredients we are sure you will be able to find everything to create your very own celebration cake. 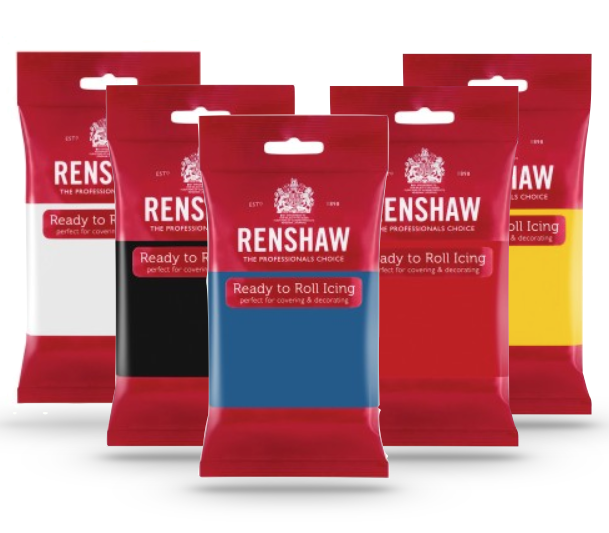 We’re excited to announce that Sugarbliss Cake Decorating Shop, now stock Renshaw 500g professional sugar paste icing in Black, White, Pink, Red, Green, Yellow, Blue. 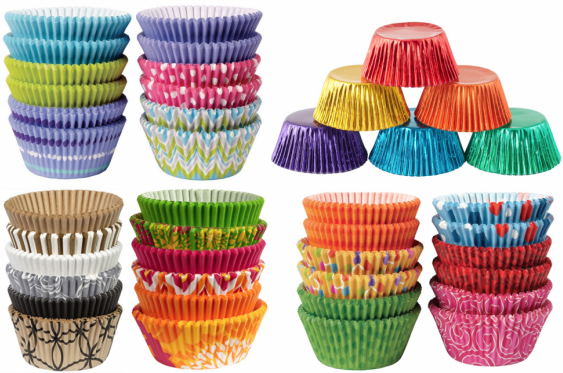 These new sizes are a great addition to their already large selection of sugar paste icing. 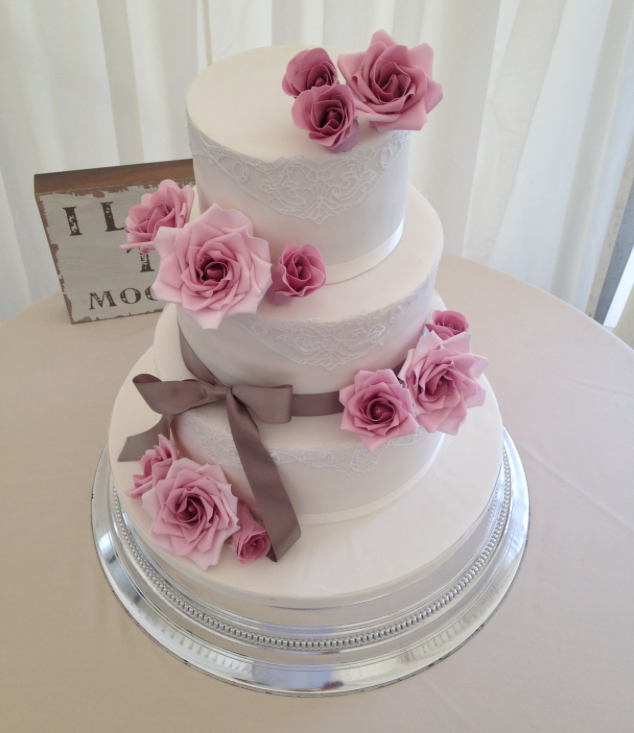 Renshaw icing is an excellent product for covering Wedding cakes and birthday cakes for a professional finish. We also stock in our cake decorating supplies shop, Solihull the complete range of M&B Luxury Sugar paste ready to roll icing in 250g and from the 1st February 500g. This sugar paste icing is perfect for creating a flawless finish on Wedding Cakes and Birthday cakes. 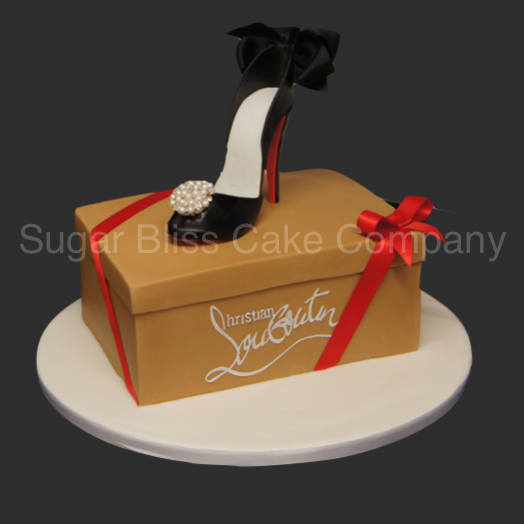 Our Christian Louboutin Shoe Box Cake was great fun to create and looked absolutely stunning. 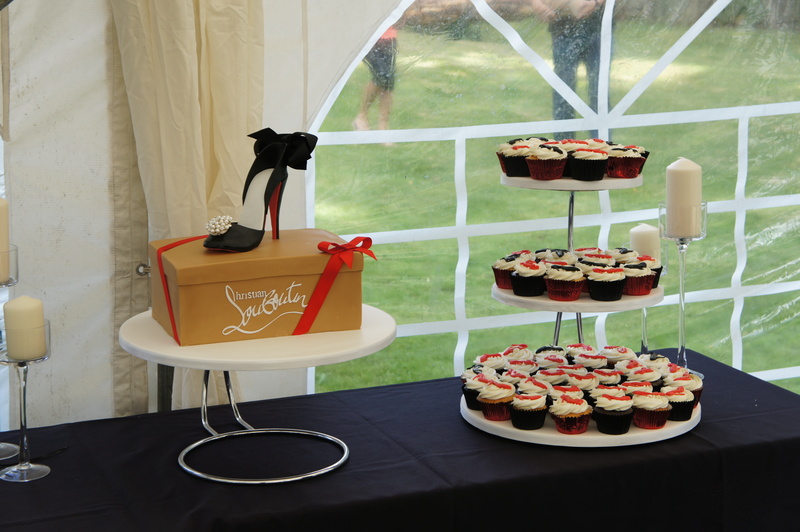 The Shoe box cake was accompanied with a cascading stack of cupcakes with edible stiletto shoes made from sugar paste icing and place on to our delicious vanilla buttercream. Using a 2D nozzle tip, we created elegant buttercream rose swirls which adorned our vanilla sponge cupcakes. Our cupcakes were also filled with a tasty raspberry/strawberry jam filling. The shoe box cake was created from our red velvet cake mix which is now available to purchase in 500g bags from our cake decorating supplies shop, Solihull, Birmingham. In order to create perfect square edges, we used a white chocolate ganache. The cake had 3 ganche coating before we covered the cake using a combination of teddy brown sugar paste icing and white icing. Once covered we then used a cake decorators smoother and a set of flexi smoothers to create the sharpe edges on the cake. The Christian Louboutin logo was made by carefully cutting out by hand, the letters from an icing sheet. It was then secured on to the front and back using a cake decorating edible glued. The Christian Louboutin sugar shoe was devised by producing stencils from an original LB shoe. Using the templates a pattern was forged on to finely rolled squires red, black and cream florist paste. Again, the pieces were secured using edible cake decorators glue. The stiletto heel was made using our silicone heel mould and a 50/50 mix of florist paste and ready to roll sugar paste. Our Silver and Gold Cake Board covering is available from our cake decorating shop, Soilhull or from our Cake decorating online shop and is a great alternative method to standard cake boards. 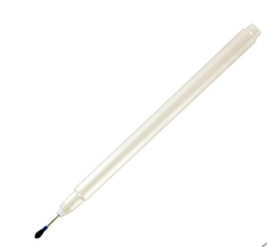 It is made from a high quality, food certified silver or gold foil, which means it can be easily folded and stored, allowing you to use this in a pinch! Our paper cake decorating products includes packs of shiny gold or silver foil to cover your cake drums and boards. Each sheet measures -735 x 915mm (29×36″) and is ideal for recovering cake boards for wedding cakes or celebration cakes or for covering your own specialised sized cake drums. These foil Cake Board covering is an alternative method to standard cake boards. 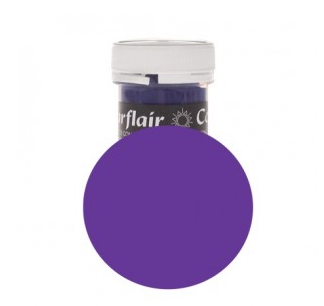 It is made from a high quality, food certified silver foil, which means it can be easily folded and stored, allowing you to use this in a pinch! 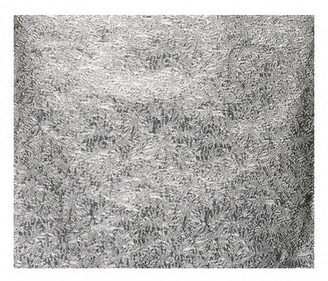 You can use this foil to cover existing cake boards. This can range from cake boards that have already been used, which you can recover to give a fresh new look, or use on a different colour board to give it a silver finish. 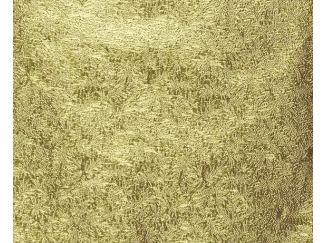 This foil is textured and will give your board a patterned finish. This foil is a great choice over regular boards, as it allows you to reuse boards you already have, and breathe life into them! You no longer have to keep different sizes of different coloured boards. Sold in single sheets or in packs of 5. 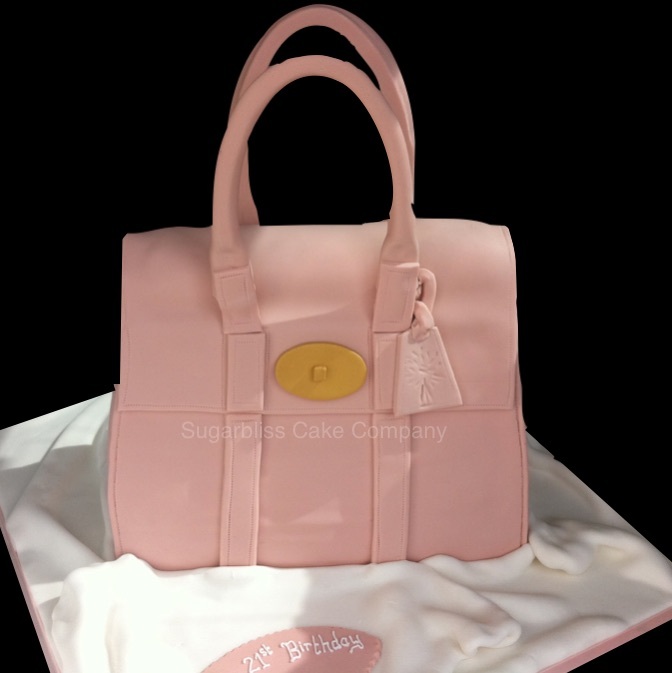 We absolutely love making designer cake handbags and this Mulberry inspired handbag cake was no exception. The cake was created from our delicious Victoria sponge with a vanilla butter cream and strawberry filling. 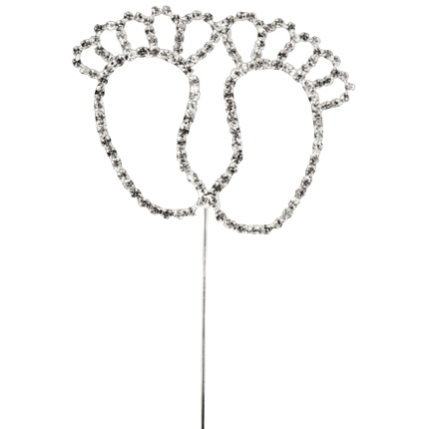 We have recently added to our range of diamante cake decorations which are available from our cake decorating and cupcake supplies shop, knowle, Solihull, West Midlands, a selection of special occasion mottoes from Happy Birthday to Happy Anniversary and baby feet to simply adorn your cake creations. Gluten, Vegan Wedding Cakes And Birthday Cakes. We have just added to our range of dietary cake flavours our new and delicious Gluten Free and Vegan cake flavour. This moist gluten free and vegan sponge cake is available to order in our celebration cakes, wedding cakes and cupcakes. Freshly baked in our Sugarbliss Cakery! We now offer in are range of dietary cake flavours our renowned eggless cake, gluten free cake, dairy free cake, vegan cake and our new gluten and vegan cake sponge. 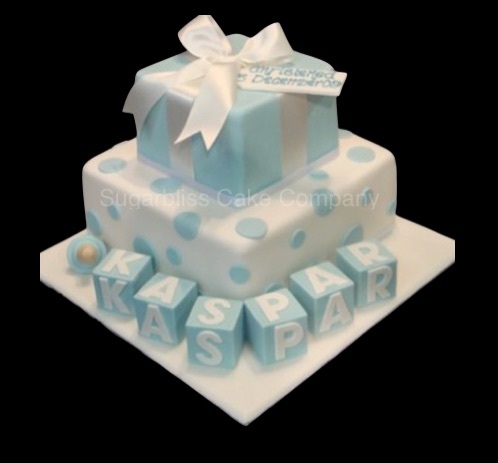 We have a large range of diamante number and letter cake decorations available in our cake decorating shop Knowle, Solihull Birmingham. We have just added a further range of celebration diamante wishes from Happy Birthday to Baby Shower pins, perfect for simply adding to any birthday cake or celebration cake. Another new must have cake decorating product which is also available to order, from our online cake decorating supplies shop is the Cassie Brown Pick’n Place Tool. This handy little cake decorating tool will allow you to pick and place dragees and small sugar decorations with ease. Add a sparkling line of dragees to your wedding cake easily and efficiently. A simple way to add sugar decoration to your occasion cake.